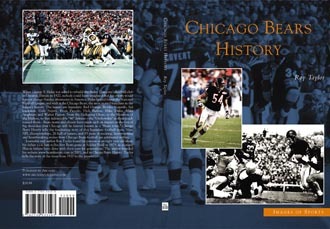 Chicago Bears History is a 128-page, softcover book covering the history of the Chicago Bears from 1920 to 2004. From their founding as the Decatur Staleys, through the move to Chicago, championships in the 1930's and 40's, the Monsters of the 1950s, to the present, it's all covered in the book. 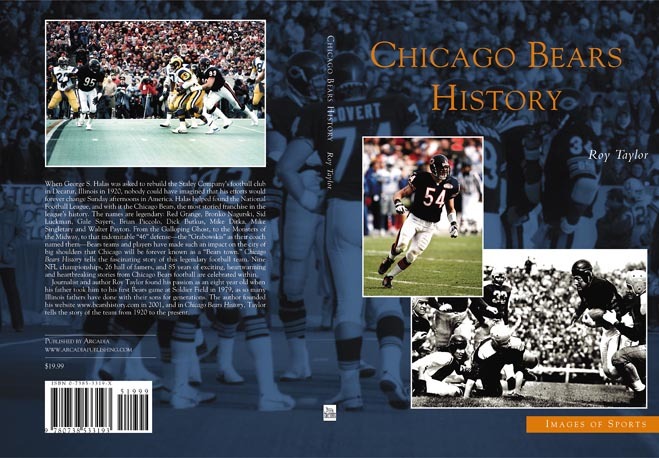 Interviews were conducted with Bear greats Doug Buffone, Ed Sprinkle, Al Baisi and others, as well as Cathy Core, founder of the Honey Bears, who will forever be remembered as Chicago's only professional football cheerleaders. The book is carried by all major book retailers, including Barnes and Noble, Borders and Waldenbooks. It is available online at Amazon, Books-a-Million, Barnes and Noble and elsewhere. If you would like to purchase an autographed, personalized book from the author please contact me using the feedback link above. I would be glad to ship one out to you and you can pay me via Paypal. Otherwise you may purchase the book online using one of the links below. I owe great thanks to former Bears Al Baisi, Ed Sprinkle, Ronnie Bull, Doug Buffone and Mark Green for speaking with me, as well as Cathy Core, the founder of the Honey Bears cheerleaders. I also thank Roger Hacker of the Bears for allowing me media access at the convention to talk to some of these players. Many thanks, of course, also go to my photo partners. In the ’75 draft, the Bears struck gold from top to bottom. By virtue of their 4-10 record from the previous season, the Bears owned the fourth overall pick in that year’s auction, which was held in late January. Of high priority for the new regime was the running game, of course, since a rotating unit of mediocrity had been manning the backfield since Sayers and Bull retired. Improving the running game would necessitate rebuilding the offensive line as well as the backfield. In 1974, Chicago had yielded 36 quarterback sacks to their opposition, Pardee noticed, even though the league did not count them as a statistic at that time. “We can’t have 50 sacks a season and expect to win any games,” the new coach said. Throughout the rest of the draft, the Bears selected eight more eventual starters on both sides of the ball. Defensive end Mike Hartenstine was their second-round pick, followed by corner Virgil Livers in the fourth, guard Revie Sorey in the fifth, quarterback Bob Avellini and linebacker Tom Hicks in the sixth, defensive lineman Roger Stillwell in the ninth, safety Doug Plank in the 12th, and finally running back Roland Harper in the 17th round. As the regular season began, Gary Huff was again the Bears’ starting quarterback, and the rookie Payton was in the lineup from the beginning. In a disappointing 35-7 loss to Baltimore in Soldier Field, Payton attempted to rush the ball eight times, but gained zero net yards. It was an inauspicious start for the future star. Payton showed flashes of brilliance throughout his rookie season, but also suffered the low-point of his career. Against Pittsburgh, Payton’s ankle was slightly injured, and a trainer insisted he sit out the game. It would be the only game the running back would miss in his career. The Bears started the season 1-6, then 2-9, then 3-10. In the season finale of the 1975 season, they finally put things together when they defeated the New Orleans Saints 42-17 in their new home, the Superdome. Payton was brilliant on the day, rushing for 134 yards and ripping off what he called the best touchdown run of his career. As the 1975 season came to a close, many facets of the Bears’ game had improved. At season’s end, seven rookies were starting for the team in Avellini, Payton, Harper, Hartenstine, Stillwell, Plank and Livers. In fact, the Bears were now led by the youngest coach in the NFL, and fielded the highest number of rookie players in the league with 17. For Hartenstine, despite the record, the players took a great deal of pride in how they played his rookie season. “We were 4-10, sure, but of the ten teams that beat us, only one of them won their game the following week. We laid it on the line and played some tough football,” he said. Despite the improvement and hope for the future, the Bears finished 1975 where they left off the previous year with a 4-10 record. In 1976, the rebuilding continued, and this time focused on the offensive line. The Bears’ top pick in that draft, eighth overall, was tackle Dennis Lick from Wisconsin. They also added tackles Dan Jiggetts in the draft and Wayne Mattingly in a trade. Also drafted that season was wide receiver/running back Brian Baschnagel and linebacker Jerry Muckensturm. Signed as free agents were safety Gary Fencik, who had been injured and released by the Miami Dolphins, and wide receiver James Scott. That season, Chicago would finally turn their record around for the first time since Dooley’s departure. They finished the season 7-7 despite playing an extremely difficult schedule that featured playoff teams in Dallas, Minnesota, Oakland, Los Angeles and Washington. Of those opponents, the Bears defeated Washington and Minnesota (second meeting), and lost by a very small margin to Oakland and Minnesota (in the first game). Payton made his first pro bowl appearance in 1976 after he rushed for 1,390 yards and 13 touchdowns in his sophomore season. Avellini had nailed down the starting quarterback job, although he completed less than 50% of his passes and threw for twice as many interceptions as touchdowns. Pardee was named NFC Coach of the Year. One young player that was making an impact on defense was safety Doug Plank, whose reputation for punishing tackles in the secondary was beginning to grow. Plank was never selected for a pro bowl, but he and Fencik teamed to become the most feared safety tandem in the NFL from 1976 through 1981.